In case you missed the announcement earlier, McFarlane Toys, known for its exceptional sculpts and attention to detail, is releasing four action figures based on the Guitar Hero franchise this November. 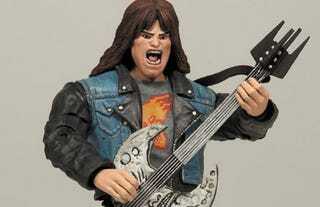 Not only does it give serious Guitar Hero fans a chance to blow up their favorite characters with M-80s, it gives the McFarlane Toys B-team of sculptors a chance to shine! These things are godawful. If you want to see full phoned-in line up, check out our gallery below. To see what we mean by "exceptional sculpts and attention to detail", refer yourself to virtually any other McFarlane Toys line.